Please note: The Ikusasa Programme has reached its conclusion and has been closed down. SANAC trust appointed the AIDS Foundation of South Africa as an implementing partner to assist SANAC trust in partnership with the Department of Social Development in the implementation of the Social and Behavior Change Programme targeting young people aged 15-24 years, in particular girls and young women with a view to decrease risky sexual behavior among young people in order to contribute to the reduction of HIV infections and unwanted teenage pregnancies in KwaZulu-Natal. 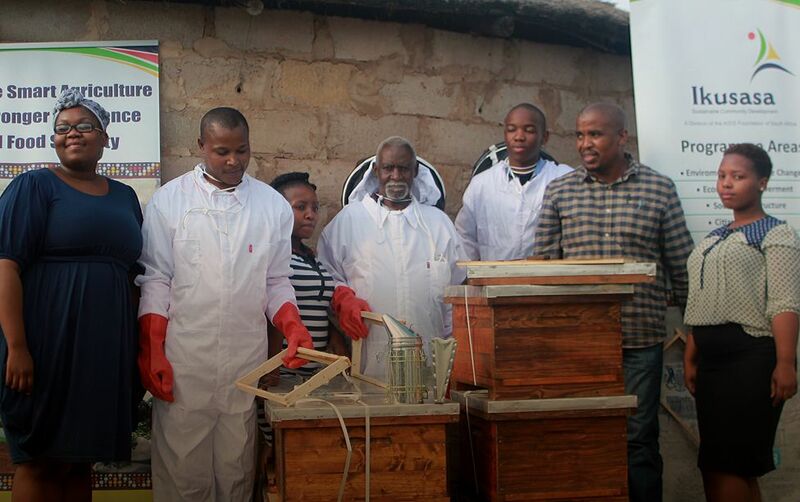 AFSA is appointed to implement the SBC Program in the Harry Gwala District, iLembe District, Amajuba District and uMzinyathi District in the Province of KwaZulu-Natal. As an implementing partner, AFSA will seek to build young people’s resilience, self-confidence, self-esteem and self-efficacy; build young people’s knowledge, attitude and skills to voluntarily assume positive practices and sustain positive behavior; invest positive values in young people to become change agents within their community; instill active citizenry among the young people; enhance communication between parents and their children on sexual reproductive health; and increase the involvement of men in the protection of women and girls from gender-based violence and HIV acquisition. The overall purpose of this programme is to enable young people, and especially young girls and women in targeted communities, to make fully informed, positive choices about their health, their sexuality and their futures, through social behaviour change interventions that respond effectively to their diverse needs, capabilities and challenges. YOLO INTERVENTION: To build young people’s resilience, self-confidence, self-esteem and self-efficacy (desired outcome: decreased risky sexual behaviours) and build young people’s knowledge, attitude and skills to voluntarily assume positive practices and sustain positive behaviour. FAMILIES MATTER PROGRAM (FMP INTERVENTION): To enhance communication between parents and their children on sexual reproductive health. COMMUNITY CAPACITY ENHANCEMENT (CCE) AND MEN CHAMPIONING CHANGE (MCC) INTERVENTION: To increase the involvement of men in the protection of women and girls from gender-based violence and HIV acquisition. This program will be rolled out in the eThekwini North sub-district of the eThekwini Metro. The interventions will be directed at orphaned and vulnerable children and youth (OVCY), and adolescent girls and young women (AGYW) most at risk, with the aim of strengthening the resilience of the individual, the family unit and the larger community through targeted interventions that address vulnerability at each level. This will enable the beneficiaries to become more resilient, be active participants in their development trajectory, and to negotiate and manage the negative effects of HIV on their economic status. Interventions will develop the human capital of beneficiaries, assisting them to strengthen their productive asset base. Through skills-building and development, beneficiaries will have a better understanding of the job market and become more employable. Lastly, interventions will develop the emotional coping mechanisms of individuals, households and the community, ultimately strengthening the connective social capital within the locality. The principal interventions to achieve this objective will be to implement the ASPIRES evidence socio-economic package coupled with the Vhutshilo 2 HIV Prevention curriculum targeting orphaned and vulnerable children and youth (OVCY), and adolescent girls and young women (AGYW) aged 15 to 19 years most at risk. The interventions will target both in-school and out-of-school OVCY and AGYW. Vhutshilo 2.2 is a HIV Prevention Education curriculum that targets youth between ages 14 to 18 years. Vhutshilo promotes HIV prevention by addressing behavioural norms, gender-based violence, and negotiation skills around condom use and sexual activity, and links participants to HIV testing, treatment and care and support services. Vhutshilo will target both in school and out of school youth. Vhutshilo will expose young people to teachings about self-awareness, coping in a complex world that may involve drugs and alcohol, ‘blessers’ and HIV and how to negotiate and make good decisions. The Financial Capability Pillar is known as the ‘IMPUMELELO’ course. The Impumelelo course for this Program shall be comprised of 7 modules and shall target the same cohorts of beneficiaries. The purpose of the course is to develop the financial capabilities of the participants and to prepare them for the financial responsibilities in adulthood. Impumelelo will target in school and out of school youth, and youth from vulnerable households between ages 15 to 19 years. The Employability Pillar will target the same ASPIRES beneficiary cohorts. The purpose of the employability pillar will be to prepare participants for the workplace – this pillar will be aimed at building self-esteem, employability skills, job search techniques, career exploration, resumes, interviewing and job success skills. The workshops are designed to teach job seekers on how to obtain and sustain employment. The Entrepreneurship Pillar will target the same ASPIRES beneficiary cohorts. The course content will be packaged into 4 modules or sessions for delivery to the participants. The purpose of the SATE pillar is to support and encourage young people to pursue tertiary education by bridging the information gap on access to tertiary education. The SATE assist youth in Grades 9 to 12 to reach academic potential with tools to map their path to tertiary education and career. EThekwini Metro Hotspots Project: the municipality project is running hotspots in ranks, community halls and some schools. Through these hotspots, young people can access internet for educational, social and economic purposes, as well as other youth friendly platforms. Cell C FreeBasics Network: where young people can access a host of online health, finance and lifestyle applications for free, including accessing Facebook, Facebook Messenger, selected news, education and health sites and online educational quizzes. To address the infrastructure backlog in previously disadvantaged communities. AFSA directly operate and supervise 13 Community Based Organisations and four direct sites. Therefore implementing the programme in 22 sites or communities. Craft making for income generation to ensure the sustainability of the organisations. Specify the number and name of sites covered by the NPO. Follow Ikusasa on Facebook and Twitter.